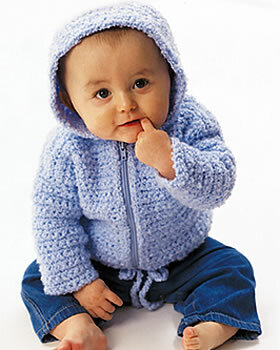 bunny mama's corner: Baby cardigans in the Web - so many awesome free patterns! 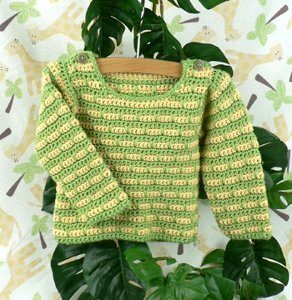 Baby cardigans in the Web - so many awesome free patterns! 1. Found it the blog of Creative Jewish Mom, but the original pattern is made by Julie Holetz and can be found here. But I should confess I like the colours and finishing touches by Creative Jewish Mom better. It just looks more elegant this way I think. 2. Hehagon granny baby jacket. 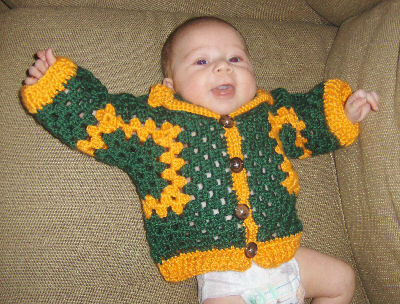 The description, made by Tina can be found in her pattern blog and is a newborn size. Bigger size (3-6 months) version made by Bev can be found here and I took the picture from Bev's page aswell. To me this one looks more girlish than boyish, but still a good and simple idea, besides if instead of using a lacy granny square stile we would use a solid granny it would look different... Just use your imagination. 3. Baby hooded cardigan with a zipper. Well, this one definetly looks boyish. But again - a bit of imagination, different colour, some embelishement like crocheted flowers or embroidery and it would look girlish enough. Two sizes - 6 and 12-18 months, which is good. 4. Baby sweater that could be a unisex sort of garmet. I will definetly try to make one like this for My Little Man for the autumn as the sizes are 6, 12, 18, and 24 months and 12 months is exactly what we need. 5. Striped Baby Sweater. This one could be made for girl or boy just by changing the colour as the pattern is unisex aswell and size range is as for the previous sweater. This one is in my To-do list for autumn too. In the next couple of days I will show you at least one finished baby cardigan or even two if I will finish the second quickly. There really was a mistake in the last link, thanks for noticing. Now it should work correctly. Let me know if it still doesnt. love the sweater with the zipper, but cant find pattern.